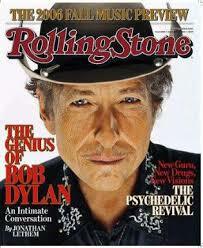 Bob is such a gifted, original songwriter and singer that it's easy to forget how smart he is. In the latest issue of Rolling Stone, The Fortieth Anniversary issue, Bob talks to Rolling Stone founder Jann Wenner, and shows off his humor and broad wisdom. WENNER: What do you think of the historical moment we're in today? We seem to be hellbent on destruction. Do you worry about global warming? DYLAN: Where's the global warming? It's freezing here. WENNER: It seems a frightening outlook. DYLAN: I think what you're driving at, though, is we expect politicians to solve all our problems. I don't expect politicians to solve anybody's problems. DYLAN: Our own selves. We've got to take the world by the horns and solve our own problems. The world owes us nothing, each and every one of us, the world owes us not one single thing. Politicians or whoever. WENNER: What do you take faith in? DYLAN: Nature. Just elemental nature. I'm still tramping my way through the forest, really, on daily excursions. Nature doesn't change. And if there is any war going on on a big level today, it's against nature.